This Demonstration plots a cubic equation of the form in the Cartesian plane to pass through any nine points , . 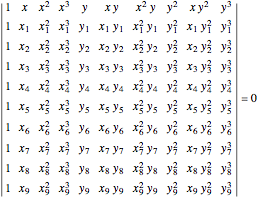 These cubic equations are often called elliptic curves. In this Demonstration, drag the points to see some of the many possible behaviors for a cubic equation. The coefficient values are rounded in the header, and should not be trusted when all values are low or zero. For some degenerate point configurations, such as the points marking the vertices and two points per side of a triangle, the matrix method used here may not work. A full method would employ special processing for degenerate lines and conics. Ed Pegg Jr "Nine-Point Cubic"